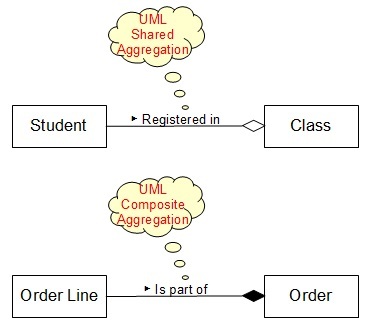 This section describes Aggregation and Composition Notations used in a UML Class Diagram. Aggregation and Composition Notations represent a special type of association called 'aggregation' between a pair of parent and child classes, where the child class is considered as a part of the parent class. Aggregation and Composition Notations are graphical notations used in a UML Class Diagram to represent a special type of association called "aggregation" between a pair of parent and child classes, where the child class is considered as a part of the parent class. 1. Shared Aggregation (also called as "Aggregation") - In a shared aggregation, instances of the child class can exist without any instances of the parent class. Usually, the child class is shared by two or more parent classes as aggregation pairs. For example, the "Class" class and the "Student" class are associated as a shared aggregation, because students are considered as parts of a class, but students can exist without registering to any class. An Aggregation (shared aggregation) Notation is drawn as an Association Notation with a small diamond shape added to the parent class end. 2. Composite Aggregation (also called as "Composition") - In a composite aggregation, instances of the child class exist only if they are associated with instances of the parent class. For example, the "Order" class and the "Order Line" class are associated as a composite aggregation, because order lines are considered as parts of an order, and order lines can not exist without an order. A Composition (composite aggregation) Notation is drawn as an Association Notation with a small solid diamond shape added to the parent class end.